Comprehensive review of Skin Laundry Wrinkle Release Repair Treatment. See how this retinol cream compares against other wrinkle creams! Skin Laundry Wrinkle Release Repair Treatment is a nice moisturizer but doesn’t work well as a wrinkle repair treatment. The first thing I noticed about this product is that retinol is toward the bottle of the ingredient list. I was surprised to see that considering this a wrinkle treatment moisturizer. This product is really easy to apply and has a thin and watery consistency. The applicator of this product is great; it’s a pump attached to a tube and it stands up which makes me think that the product won’t go to waste, which is important because this is such an expensive product. At first, I noticed that this product made my skin look and feel moisturized. I liked the way my skin felt and it looked a little tighter and more glowy. After time, this product was a lot less impressive. It continued to moisturize my skin but it really didn’t improve my wrinkles and fine lines at all. I think this is probably due to the amount of retinol that this product contains. 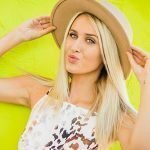 Overall, Skin Laundry Wrinkle Release Repair Treatment isn’t a great product for targeting and getting rid of fine lines and wrinkles. Skin Laundry Wrinkle Release Repair Treatment comes out feeling thin and liquidy, and as you work the moisturizer into your skin, it has a cooling effect on the skin. As you work the product in, the moisturizer becomes less thin and liquidy and feels more like a thicker cream that leaves a bit of a residue on the skin. I really like the bottle that Skin Laundry Wrinkle Release Repair Treatment comes in. It’s a tube with a pump that can stand up which makes me feel like product won’t be wasted in the tube. The moisturizer itself is easy to apply and it spreads out nicely. The only thing I think is bothersome is that the directions say to use three pumps of product. If you use that much product, you’ll run out pretty quickly which is unfortunate because it’s expensive. Skin Laundry Wrinkle Release Repair Treatment takes 30 seconds or so to dry once it’s totally worked into the skin. The product doesn’t totally absorb into the skin; it leaves a little bit of an oily residue which I really don’t prefer. 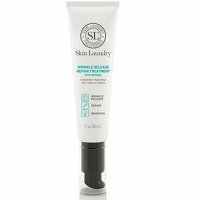 There is a slight smell to Skin Laundry Wrinkle Release Repair Treatment which is a little bit like plastic. The scent isn’t pleasant but it also doesn’t last very long on the skin, and isn’t even very strong to begin with. I noticed a little bit of short term results with Skin Laundry Wrinkle Release Repair Treatment; my skin definitely looked nice. The morning after using this product for the first time, my skin was moisturized and my skin felt tighter and just looked overall healthy. Over time, Skin Laundry Wrinkle Release Repair Treatment didn’t do much for my skin. I liked this product as a moisturizer but other than making my skin feel moisturized and look nice, it didn’t do what I expected it to. I was hoping that I would notice a difference in my crow’s feet or in the lines on my forehead and around my mouth, but this product really didn’t help those areas at all. The first thing I noticed when looking at Skin Laundry Wrinkle Release Repair Treatments ingredient list is that retinol is very low on the list. 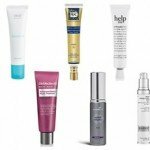 Not only is retinol low on the list, but I struggled to find any ingredients I recognized. But, I did see there was safflower seed oil, shea butter, and caprylic which are all known to be good for targeting wrinkles. First, safflower seed oil helps to give the skin a healthy glow and reduce the appearance of wrinkles by hydrating the skin and promoting elasticity. Shea butter is great for fighting fine lines and wrinkles by reducing inflammation and adding moisture back into the skin. Lastly, caprylic is great for fighting wrinkles and toning and tightening your skin. It contains medium-chain fatty acids that help repair the skin and restore moisture. The cost of Skin Laundry Wrinkle Release Repair Treatment is $40.00 for 1 oz. 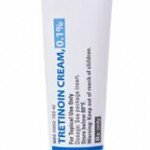 This is a very expensive retinol cream, especially because this product doesn’t even contain very much retinol. Skin Laundry Wrinkle Release Repair Treatment can be returned for up to 30 days for your money back, although they won’t pay for shipping. But, after 30 days, you can get a store credit for the amount of the original purchase price. To buy Skin Laundry Wrinkle Release Repair Treatment, click here.